Author JohnnyPublished on October 10, 2011 November 13, 2011 1 Comment on Facebook – Friendster for Everybody Else! Facebook - Friendster for Everybody Else! The Onlies, being modern youth, do like their social media. We shoulda mentioned this before, but you can of course Like the Onlies Facebook page, just as much as you can like them in real life. Actually, you can only Like them once on Facebook, but feel free to like them more than that in real life. The band is taking a month-long break for, among other things, exotic traveling to the Euro-zone. Stay tuned for tales from the road, but put the night 0f November 10th on your calendars for a raucous return engagement to A Terrible Beauty. Published on October 10, 2011 November 13, 2011 Author JohnnyCategories Uncategorized1 Comment on Facebook – Friendster for Everybody Else! Vote for A Terrible Beauty! 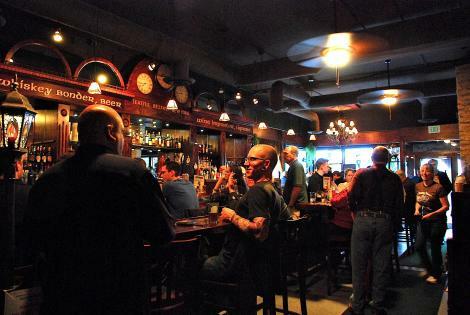 Our friends at A Terrible Beauty Irish Pub in West Seattle are competing in the Best of Western Washington contest under the Best Irish Pub category (and a couple of other categories as well). Voting continues until October 10th. The Onlies will be be playing there on November 10th, so wouldn't it be great to have them win that category with Onlies fans' help? Concert for Kids this Saturday, October 1st! 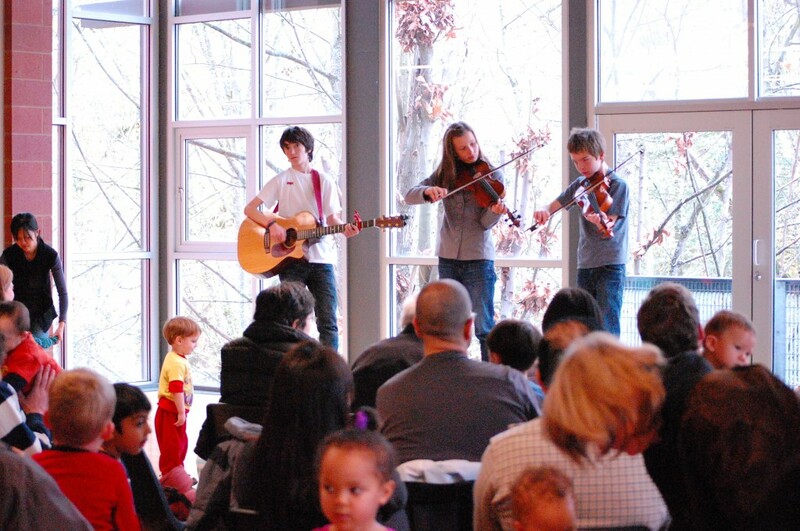 As part of the Haller Lake Community Council's Concert for Kids series, the kids will play a concert on Saturday morning, October 1st from 11a-12p at the Northgate Community Center. Kids of all ages welcome, and their minders. 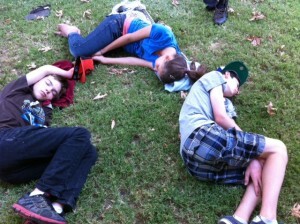 Pictured here are the Onlies playing this same concert last year. Don't they look young! Oldtime Showcase and CD Release this weekend! 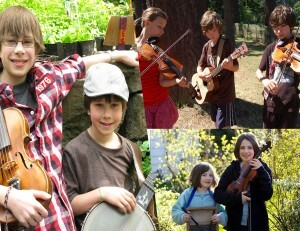 Sunday Sept 25th Multigenerational Oldtime Showcase with Professor Banjo! Three bands with stellar youth musicians, including the Onlies, join Paul Silveria (Professor Banjo) for a footstomping oldtime showcase to celebrate the release of a new CD called Professor Banjo PB and Jam! This show will conclude a three day/three city tour! It's going to be great fun for all ages, especially those with young kids! We hope you can make it! Sponsored by the Seattle Folklore Society and held in the lovely concert hall at the Phinney Neighborhood Center! Reservations are recommended! Details here. This Oregon Music News article has more information about the project. The Onlies are now back in Seattle, after a whirlwind of a great time at Valley of the Moon, and a sublime siesta on the beautiful campus of San Jose State University. The kids learned lots of tunes that they will start incorporating into upcoming sets. 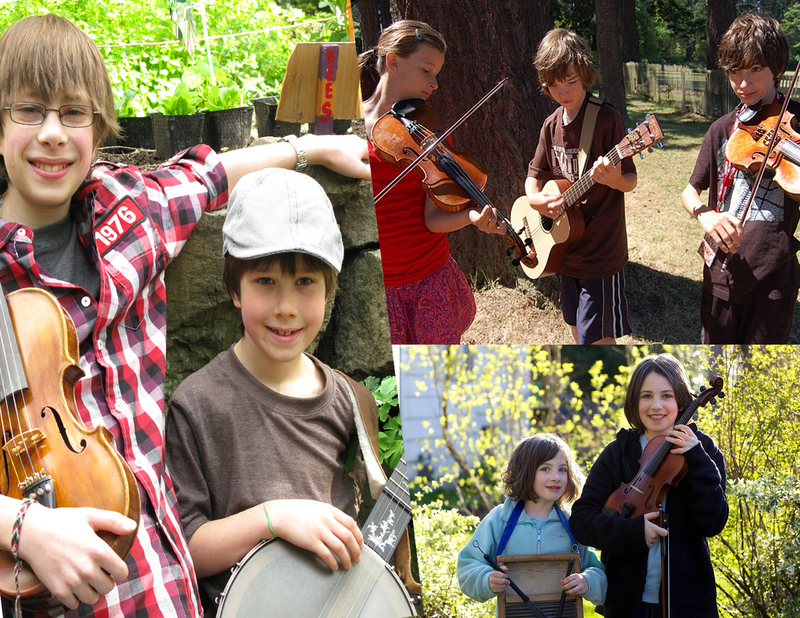 First up: busking at the Redmond Saturday Market from 10 a.m. to noon Sept. 10, and a performance later that day at the Northgate Festival, 3 p.m. Catch them if you can! 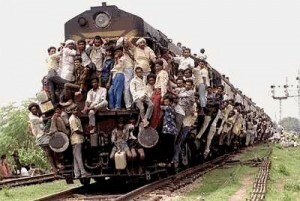 The Onlies, along with Tom and Johnny, are riding the rails down to the Santa Cruz mountains to attend the Valley of the Moon Scottish Fiddle School. 24 hours down, and 24 hours back up, Burlington Northern willing! Once they are back in September, there will be plenty of chance to see and hear them. Check out the Gigs link at the top of this page, but some highlights include two concerts in Northgate, and a CD release show at Phinney Neighborhood Center.